We are always on the look our for new products to make our trailers the best of the best. 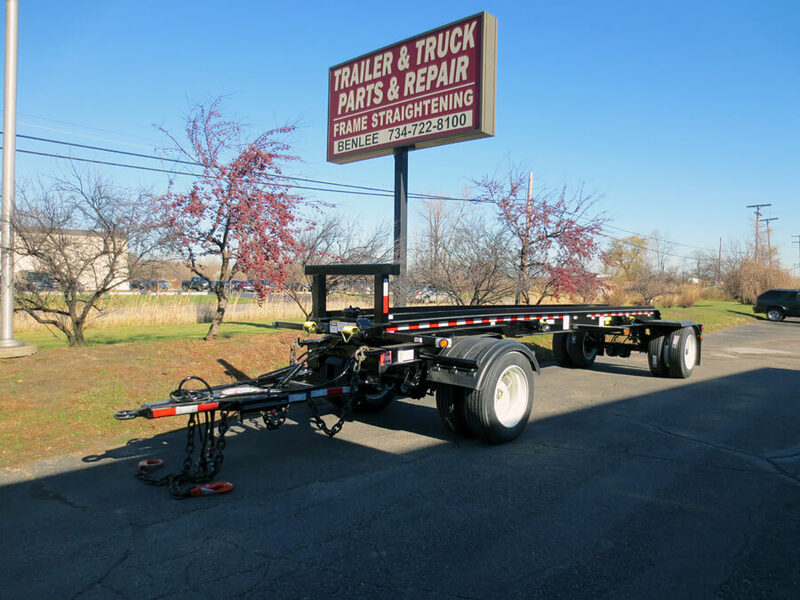 Call us at 734-722-8100 for a quote, or if you are a supplier and have an idea for make our trailers safer, call me at the office at the same number. Roll off Pup Trailer Manufacturer BENLEE has pup trailers for sale and in stock to ship today. Sorry at this time we do not have any used pup trailers for sale. Stock unit are non dumping with no hoist, BUT we do make a Dumping roll off pup trailer. These are 24′ roll off trailers that can carry 20, 30 and 40 yard boxes. Of course they have a steerable axle and come in 2, 3 and 4 axle. The units in stock are 2 axle. These are semi trailers that use a fifth wheel. If you want to carry two boxes at once, a 24 foot pup trailer is one of the ways to make this happen! One of the versions we make are a live pup trailer that has a hoist and a full set of hydraulics. Roll off Pup Trailers for Sale at BENLEE is what we talk about. BENLEE the leader in high capacity and high up time trailers Roll off Trailers, also has the market leading pup trailers in stock! When you want to double you capacity and not double you drivers, a pup trailer could be your answer. If you are looking for pup trailer manufacturers, you found it! Importantly we make both ‘dead’ (no hydraulic systems) and ‘live’ (complete hydraulic systems) pup trailers. Live pup roll off trailers dump, just like a roll off truck or roll off trailer! So when it comes to 28′ pup trailers, call us at 734-722-8100.